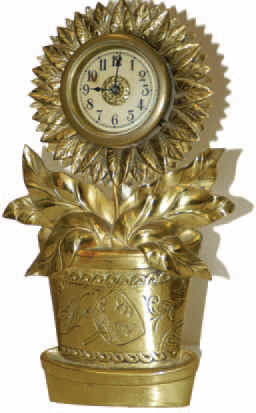 Waterbury Clock Co. Rare metal cased novelty clock, "Sunflower", ca 1890. Large 11 inches high, solid cast brass case. It takes a male key to wind, I found one in all my junk, wound it, and it runs. Key will come with the clock. One day, time only movement. The back stand has been added, that is good, or it was reattached after being broken. Ly-Waterbury No. 1975. This rare little clock booked for $700 several years ago.